Isabela is called the Island of Sand and Volcanoes – and this is precisely what awaits you. You can spend several days, relaxing on secluded beaches and visiting young fire mountains. 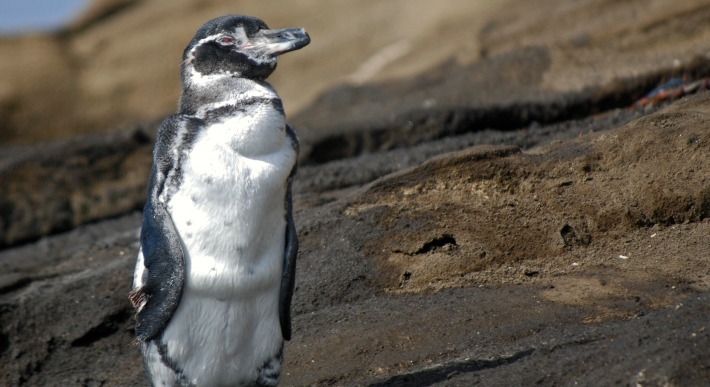 Isabela is also the place to go to see Galapagos penguins and flightless cormorants. Many other sites require a guide. Tours are easily arranged on Isabela island, or you can book a package through an agency in Puerto Ayora on Santa Cruz island. Visitor sites are open 6am – 6pm. Near Puerto Villamil’s port is Concha de Perla, a small cove with crystal clear water perfect for snorkeling. The underwater world here is breathtaking, with penguins, sea lions, chocolate chip starfish, rays, turtles and multitudes of other marine life. Go on tour, or walk the 250-meter path near the port to get to the shores. Centro de Crianza Arnaldo Tupiza is where Galapagos National Park rangers are raising tortoises to replenish Isabela island’s endangered giant tortoise population. This island is unique in that five species are present. Located 1.5 kilometers (1 mile) from Puerto Villamil. Open 7am – 5pm. Past the tortoise breeding center and along the road to the Wall of Tears are several pozas, or lagoons where flamingos, rails and other waterfowl may be seen: Poza de las Diablas, Pozas Verdes, Poza Redonda and Poza Escondida. Beaches also line the road out to the Wall of Tears. The best surfing is at Quinta Ola and Playa Barahona (40 – 50 minutes west from Puerto Villamil). Playa de Amor is a shallow lagoon with fascinating tidal pools at low tide. Playa del Estero is a secluded arm of the sea surrounded by forest where you can leave the world behind. Near Playa del Estero is a marked lava tunnel. Muro de las Lágrimas – Wall of Tears – is a reminder of when Isabela was host to a prison colony. Inmates had to repeatedly build, tear down and rebuild this 100-meter-long stone wall as part of their punishment. Also on site are remnants of the World War II-era US military base. Las Tintoreras are islets just offshore from Puerto Villamil. Here you’ll see Galapagos penguins, blue-footed boobies, nesting marine iguanas and nursing sea lions. The big feature is the white-tipped sharks (tintoreras) that rest in narrow channels. A guide is required. A lunar-landscape world awaits you at Sierra Negra volcano. Of Isabela’s six volcanoes, this is the nearest to Puerto Villamil and it is one of the largest active craters in the world. The chiva (rustic bus) takes you as far as El Cura from where it is eight kilometers (5 miles) to Cerro Chico, site of the 2005 eruption. Sierra Negra can also be combined with a tour to the sulfur mines (Minas de Azufre, 12 kilometers / 7 miles). A guide is required for either hike, which can also be done on horseback. On the coast west of Puerto Villamil, you can explore the labyrinth of lava tunnels. These were formed as lava flowed from Volcán Sierra Negra to the sea. The variety of marine life here makes for astonishing snorkeling. These can be visited only on a guided tour. Due to sea conditions, the lava tunnels are best visited January – May. Follow in the footsteps of Charles Darwin with a visit to Caleta de Tagus on the west coast of Isabela island. Since the early 19th century, this cove overshadowed by Volcán Darwin has been a popular rest stop for pirates, whalers and tourists. Wildlife includes giant tortoises, land iguanas and birds. Accessible only on a tour. Other sites, like Elizabeth Bay, Urbina Bay and Fernandina Island, can be visited on boat tours arranged from Puerto Villamil. Many of these destinations are also included on multi-day Galapagos Island cruises. Prime scuba diving sites near Isabela are Isla Tortuga and Roca Cuatro Hermanos, among others. Cabo Marshall and Punta Vicente Roca are also good for snorkeling. Even though Isabela is at the far western end of the Galapagos archipelago, it is still easy to get there with local boats and flights, or book an all-inclusive tour from Santa Cruz island. Puerto Villamil offers a handful of restaurants and hotels. If camping is your thing, stay at Campo Duro Eco-Lodge. Take plenty of cash with you to Isabela, as there is no ATM or bank. There is a $10 dock tax upon arriving at Puerto Villamil. Have you been to a place or done an activity on Isabela island that you would recommend to fellow travelers? Share your tips in the comments below.